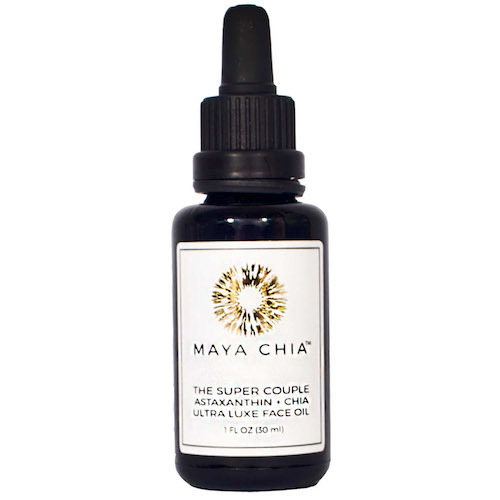 The Super Couple by Maya Chia combines the potent power of astaxanthin from Hawaiian algae, with omega bursting supercritical chia oil to make skin feel supported and repaired. High quality, small particle ingredients were specifically selected for a feeling of deep down hydration. The supporting cast of botanicals include carrot seed, Bulgarian rose, jasmine, German and Roman chamomile, cistus, myrrh and frankincense, to name only a few. This multi-functioning formula improves the appearance of hyperpigmentation, dryness, fatigued, or inflamed skin. If you're looking to simplify your beauty ritual, this Maya Chia face oil serum can easily replace a few steps by offering the look and feel of moisture, repair, and soothing in just a few drops. Place a several drops (4 to 8) of this botanical infusion on your face & neck, morning & night. It is slightly pink in color and will give your face the appearance of a slight glow. Yes - I'm also with the overall consensus here - this product is absolutely beautiful and I use it twice to three times a day ! I'm almost through my second bottle since January. I've noticed on older/tired skin especially it brings a full vibrance and glow to skin immediately. I am prone to acne/clogged pores, and have extremely dry skin. My skin DRINKS this up and loves it !! Thank you maya chia !! I found the holy grail. I got this in the January Beauty Heroes box and I was amazed. I have skin that is starting to age with wrinkles and loss of glow. Plus, my skin used to be terribly acneaic (lots of derms and chemicals in my younger years). With my use of natural skin care and a change in diet, my skin is now simply reactive here and there, with wrinkles. Overnight, after my first treatment, my acne looked more clear. It could be a fluke, though. So, one week in and I know it's this serum. I'm on my second bottle, ordered one for a friend, and may place an order for me tonight since I don't want to be without it ever again. This was a spectacular Hero box gift! I use this on my retinol nights to add some hydration! Along with small swipes of Maya Chia Super Blend. I sooo look forward to using it too. I've seen more results with this oil than any other ($185 serum, hint, hint), no shade. The bright orange color and earth smell draw me right in. I wake up so refreshed looking. If anyone asked, this would be one of my top recommendations for oil. I have been wearing this face oil since the summer of 2016 and was SO happy to see it in my first ever Beauty Heroes box this January. The smell reminds me of citrus and woods, and it is so light that I can wear it under my makeup each day. I used to have awful hyper pigmentation scarring from acne, especially along my jawline, and after using this oil for about 6 to 7 months my skin looks so clear! I actually get compliments on my skin (for this first time in my life), and people have been mistaking me for a 20 year old (I am 25). I absolutely love this product! I received this in my January Hero box and I used every drop. My skin is oily and acne prone with large pores. After two months of using every night and most mornings, I noticed a medium-small reduction in the size of my pores, and overall the texture of my skin feels smoother and looks brighter. I will be buying again.